Sri Lanka claims a rich traditional folklore. Nevertheless the country’s commercial music industry only emerged around eight decades ago. This chapter focuses on the trajectory of the Sinhala commercial music industry, from the emergence of music in the country to its contemporary commercial position, and examines the impact of this process on the Sinhala commercial singer (gayakaya) [Etymologically, gayanu means, singing or playing a musical instrument—W Geiger, An Etymological Glossary of the Sinhala Language (Asian Educational Services 1941). Gaya means ‘verse or stanza’, while gayakaya (noun), translates as singer or chanter. Gayanakaranawa (verb), translates as ‘to sing, chant; play on a musical instrument’—C. Carter, A Sinhalese English Dictionary (The Ceylon Observer Printing Works 1924)]. Such a focus on the progression of the country’s music and its commercialisation is useful in understanding the concerns expressed by vocalists (gayakayan) that this book examines, namely cover versions and secure position. This will further demonstrate that the historical influences that have shaped the industry and the practices of its singers have contributed to the vocalists’ perception of contemporary problems as reflected in the qualitative data gathered. 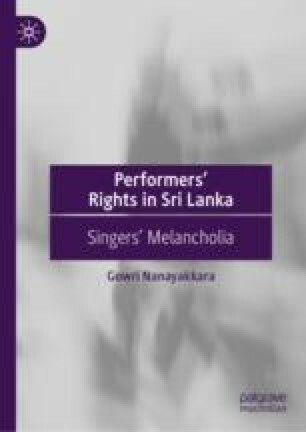 Parts of this chapter was published as G Nanayakkara, ‘Promise and Perils of Sri Lankan Performers’ Rights: The Royalty Collection in Music (2017) 23(1) European Journal of Current Legal Issues. Carter, C, A Sinhalese English Dictionary (The Ceylon Observer Printing Works 1924) http://dsalsrv02.uchicago.edu/cgi-bin/philologic/getobject.pl?p.9:5.carter. Jayasuriya, Shihan De Silva, ‘Portuguese Imprimatur on Sri Lankan Language, Music and Dance’ http://www.gis-reseau-asie.org/uploaded_files/congress/a24shihan_de_silva_jayasuriya.pdf. Sirimanna, Bandula, ‘Ringtones Becomes Lucrative Business for Middlemen at the Expense of Song Producers’ (The Sunday Times, 1 June 2014) http://www.sundaytimes.lk/140601/business-times/ringtones-becomes-lucrative-business-for-middlemen-at-the-expense-of-song-producers-100646.html. Verdin, Oliver, ‘Guide to Sri Lankan Cinema’ http://theculturetrip.com/asia/sri-lanka/articles/guide-to-sri-lankan-cinema-films-and-stories-you-should-know/.